Austin, TX has been a city I’ve been wanting to go to for the past year or so and Hannah and I finally made it happen! We went for four days over New Year’s and had such a great time. From the people, to the food, to the shopping, Austin has so much to offer! Although it was a little chillier than we were hoping for and we had some setbacks starting with me leaving my entire wallet on the flight there, we made the best of our short trip and cannot wait to go back! I’ve decided to share my trip in three sections: cocktails and juice, brunch, and shopping! This guide is really brief and only reflects our short trip to Austin - we know that there is so much more to see and explore! The first night we went to Grizzelda’s which is a modern-chic Mexican restaurant with funky vibrant decor. It is the perfect place for happy hour, brunch, or dinner out with friends! We got the spicy margaritas, queso, crispy brussel sprouts, and the dry aged beef tacos. Everything was to die for. The second day we went to Goodall’s Kitchen at Hotel Ella for an afternoon tea service and prosecco! This hotel was so quaint and adorable, and the tea service was so fun! I had never done this before and it was such a great way to relax for the afternoon while also fitting in happy hour :) the porch around the hotel is also the perfect photo op! Another amazing place for cocktails is Joann’s Fine Foods at the Austin Motel. This was probably one of our favorite spots the entire trip. The motel is the best mix of quirky and retro and is the perfect place to hang out for an afternoon. 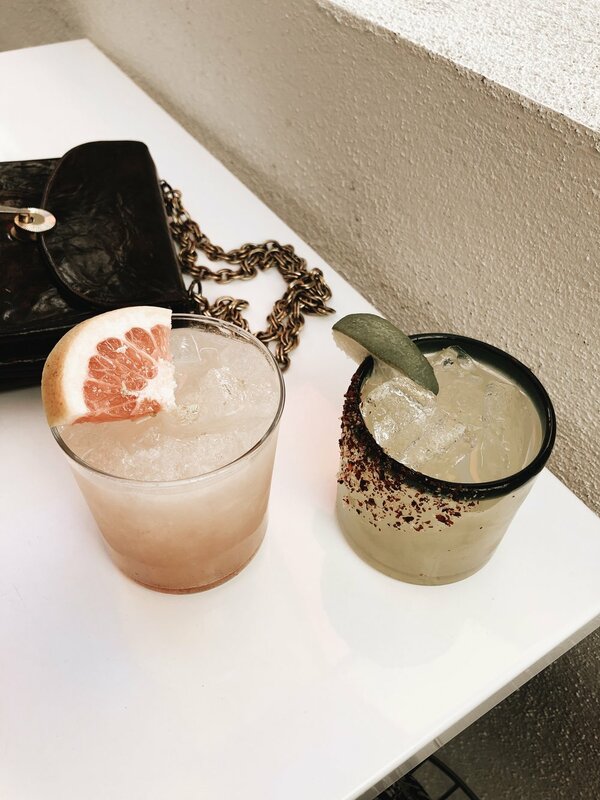 Our favorite cocktails were the retro margarita and the pink peppercorn paloma. 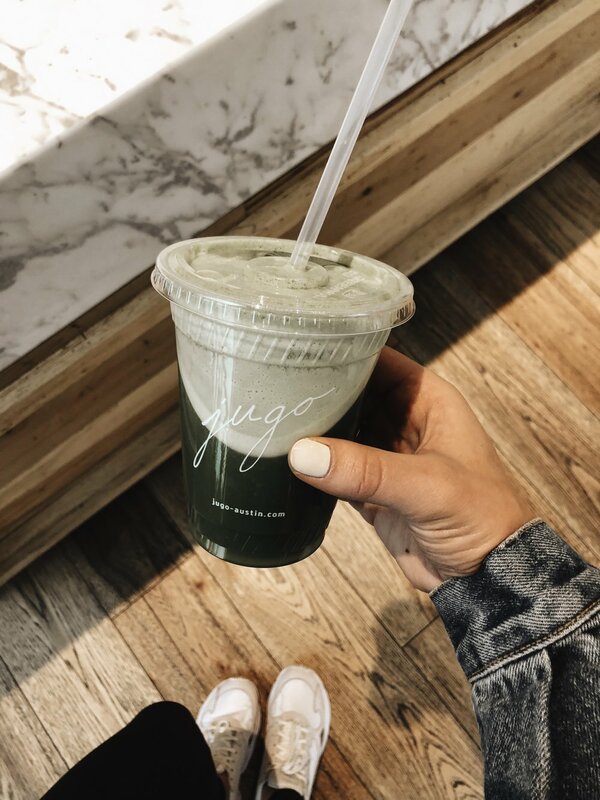 On New Years we decided to grab some juice to start the day and ended up finding the cutest new juice shop downtown right off of the famous 6th street called Jugo. I got a green juice and Hannah got one of their smoothies and they were both so good! Another juice shop we wanted to go to but didn’t have time to is Juice Society - it’s on my list for next time! Hands down the prettiest coffee shop/cafe I’ve ever been to is Hanks. 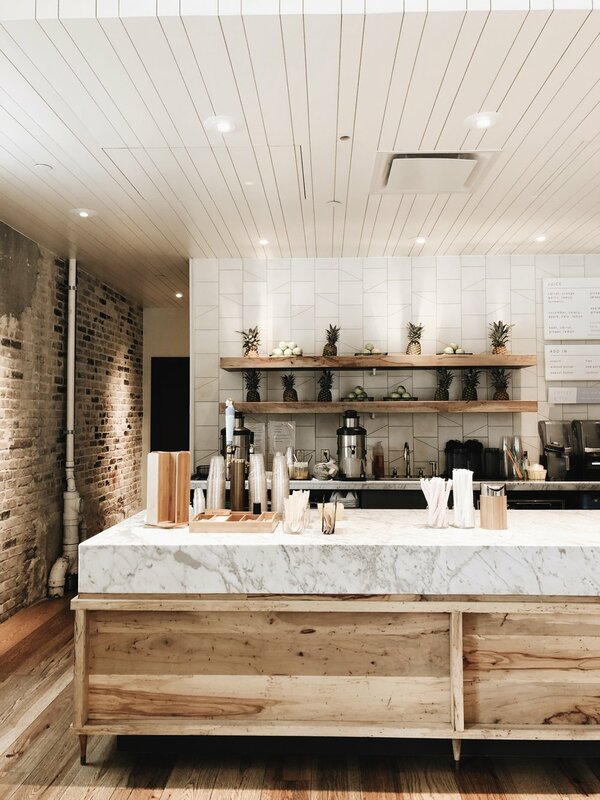 From it’s gorgeous outdoor patio, to it’s drive-through and bright airy interior, this place is what aesthetic dreams are made of. We came here for coffee and brunch and I was so relaxed and happy the entire time. A lot of the times when I travel places look so different than I expected or than what I saw in a photo. Hanks is one of the only places that was exactly how I imagined or even better! Another brunch spot we went to was Café No Sé. This restaurant is located on S. Congress Ave which is one of Austin’s most lively areas. From bars, to hotels, to eclectic gift shops and vintage book stores, this street is poppin’! We sat on the patio so we got to take in the atmosphere while we ate which was so nice! We got the sweet potato hash and the gluten-free oat pancakes with peach compote (DROOLING). Still dreaming about this meal! I couldn’t recommend this spot more. On New Year’s we brunched at Hillside Farmacy which did not disappoint! This restaurant‘s building is a restored drug store and has such a chic, vintage feel - it’s the perfect spot to go to on a date or with family! Their patio is beautiful so I would definitely suggest going here in the warmer months! There are other amazing stores on and around S. Congress Ave that are worth checking out as well! One of the most beautiful boutiques I’ve ever stepped foot into called Esby was in this area. 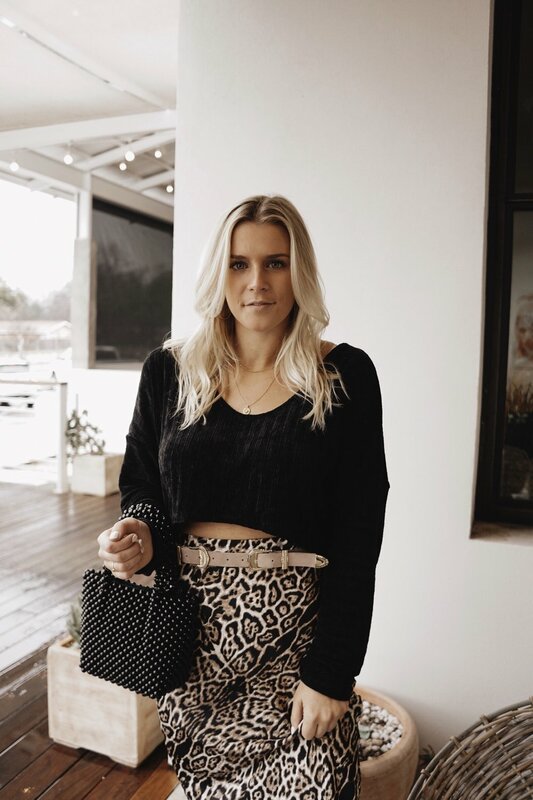 This boutique features a local brand and has the most gorgeous apparel, accessories, and shoes. I definitely took notes on the interior design of this shop - everything was heavenly! Overall, Austin was such an amazing weekend trip! Next time I want to go back when it’s warmer and when I can stay for longer at a hotel with a pool! It would be the perfect girl’s trip, weekend getaway with a boyfriend, or even a bachelorette party! I was obsessed with all of its earthy tones and laid back spots - which definitely sparked some creative energy for me. If you find yourself in Austin anytime soon definitely check out some of these spots! Thanks for checking out this post & have a lovely week!